When you picture a hallway, what do you usually see? For me, it’s a narrow area with a spot for shoes, umbrellas, knickknacks, and a wall adorned with photographs and other wall décor. Some are lucky enough to have a space for a table where you can see the trusted combo of flowers, candles, and a piece that welcomes you into the home (a framed quote or big letters spelling WELCOME are just some of our bets). But have you ever imagined a hallway that doubles as a guest room? Probably not! However, given today’s compact units and clever space solutions, this is possible and it can be done in the coziest of ways. Norwegian company Ett rom til, known for their top-of-the-line space-saving solutions, perfectly captures how it can be achieved. 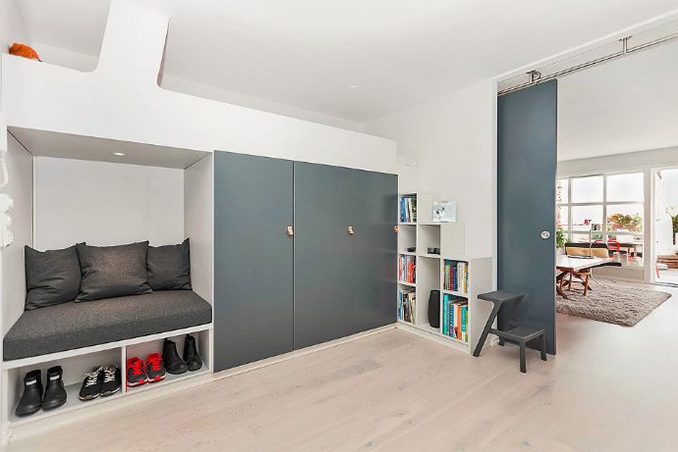 They recently created a multifunctional hallway with a loft bed and unexpected storage pieces. We’re completely inspired and we can’t wait to apply some of the ideas at home!